The kids inspired and parent invented Kolki Brand is focused on providing you with ease of mind when it comes to your children’s safety. The cute red Child Guard Watch has been one of the Flagship products of the brand for years, as it is both appealing for the kids with it’s cool looking design and parents favorite for its seamless GPS tracking. Rest easy knowing where your kids are instantly with Kolki, the the child guard mobile watch. The Child guard mobile watch reports the precise GPS location any time you desire, for parents’ ultimate peace of mind. Chat to your child using Kolki, with up to 2 registered numbers allowed to call the device. Or let your kid call you at the push of a button. The Kolki Child Guard Mobile Watch allows three SOS contact numbers to be available at click of a button for emergency situations. But of course your kid can also just call if she is out of school earlier and needs to be picked up. SINGAPORE CUSTOMERS: The Kolki will not be compatible in Singapore from April 2017 due to the suspension of 2G Networks in the region. PLEASE NOTE: Device is only compatible with 2G Networks. Device cannot be used in Turkey, India, Korea & Japan. Device is compatible in Singapore until April 2017. How do I log in and connect to my Kolki 2 App? The basic login for the Kolki is as below. IMPORTANT: You DO NOT have to create an account on our website. You MUST REGISTER a New Account. You and your family can access your Kolki Watch or Watches through this account. You can select a User Name and Password of your choice. Multiple Kolki Watches can be linked to one account (see List). User can access the same account as long as they use the same Username and Password. After you have registered your details you will come to Add Device Menu. Select “Add Device” to add your Kolki Watch. Fill in the device information and details. Watch Number: This is the SIM Card Phone Number within your Kolki Child Guard Watch. 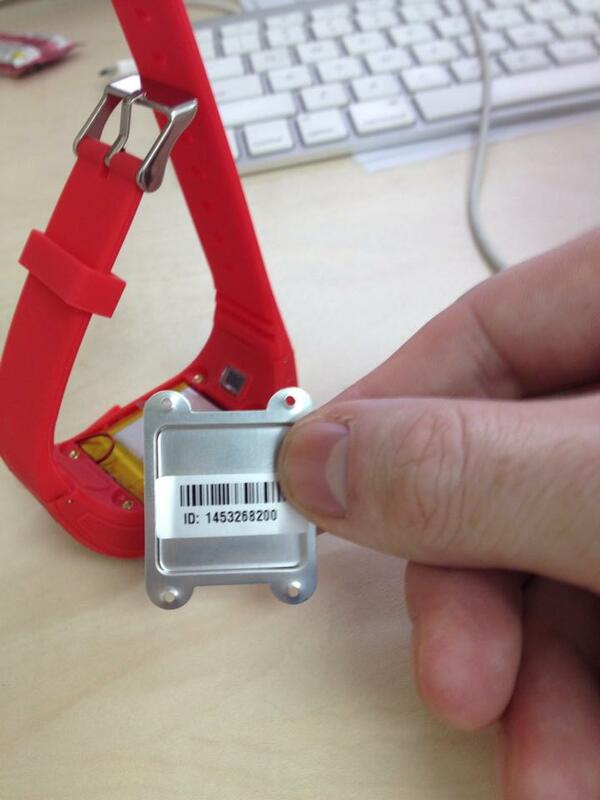 Watch ID: Is the Code on the back of the metal plate on the bottom of the watch. These codes can be changed and adjusted within the App once you have logged in. 1. Remove all protective stickers from the watch screen. 3. Please ensure that Caller ID & GPRS functions are “ON” or Enabled. -Make sure the watch is powered down before installation. -Using the small screwdrivers provided remove the 4 screws from the bottom of the watch. – Carefully remove the metal plate from the bottom of the watch. “ID 1451428307”. You will need this number at a later stage. – Using the transparent strip at the side of the battery, carefully lift the battery. – Move the SIM card slot in the direction of “OPEN” until you hear a click. – Carefully open the SIM card slot and insert the SIM Card inside. – Close the SIM card slot and move the slot in the opposite direction to “OPEN” until you hear a click. – Please be aware that the Kolki Child Guard Watch uses about 4 to 5 Megabytes of Data per month. How To Download The Kolki 2 App? How do I turn on the watch? Press and hold the power button for a few seconds. The watch should light up. How do I turn off the watch? You turn off the watch 2 ways. 1. By pressing and hold the power button. The watch should power down. Connect the watch using the USB cable provided to USB port. The battery consumption depends on how often the watch wearer uses the watch. On average battery life should last for 2 to 3 days before you need to charge again. To adjust the volume of the call simply press Family Key 1 to increase volume or Family Key 2 to decrease volume. How does the watch answer calls? When the watch is receiving a call, the press the SOS buttons to answer. How does the watch call one of the SOS numbers? MY Kolki is displaying this “SIM 1 PIN”. What does this mean? This means the SIM Card in your Kolki is “locked”. You will need to unlock the SIM card in your Kolki for it to work. If I Use the Kolki On A Regular Basis, How Much Will the Service Costs Be? The costs of using the Kolki depend on how often you use the watch and the package and service provider you selected. The average amount of data used through the Kolki we have found is about 4 to 5 Megabytes per month. On this page you can found everything there is to know about the Kolki app and about the Kolki 2 app. PLEASE NOTE: Device is only compatible with 2G Networks. The device cannot be used in Turkey, India, Korea & Japan. The device is compatible in Singapore until April 2017. The Kolki 2 app is our latest version of the popular Kolki Child Guard Watch. It includes a few new features compared to the first version. Once you have installed a SIM Card from your local operator you have the choice to install the Kolki Child Guard Watch app or the Kolki 2 app. The Kolki 2 app installation, however, does require that you send a text message to your Kolki so that it is ready to use the full features. IMPORTANT: First install a SIM card into the Kolki. Then arrange to first send the following text message. Now install the Kolki 2 app onto your phone. Create a user account under which you will register all Kolki Watches you might own. Login to the Kolki 2 app and enter the Kolki Watch ID and the SIM Card phone number. This older app includes only basic options and is tied to your phone and Kolki. It cannot be used for managing multiple Kolki on several phones simultaneously. Should you already be using the Kolki 1 app it is possible to switch to the new Kolki 2 app by following the instructions above. Our FAQ for the Kolki App can be found here. Press and hold the power button for a few seconds. The watch should lights up. Followed by pressing Key 1 once. Then press Key 2 once. The Kolki will then power down.